I love making soups and stews. The formula is simple: chop a variety of veggies, whatever you have, a food combo that sounds good to you and are in the mood for, simmer it all in a broth of your choosing until the veggies are cooked to your liking. 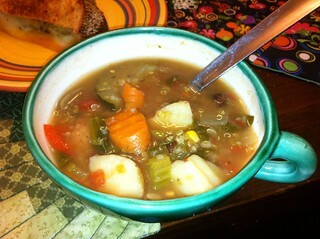 Friday night I made an 8-quart pot of vegetable soup. I always make a batch that big. No, I don't have an army of children. Yes, I have a roommate, but he doesn't eat vegetables. I froze about half of it in serving-size containers. I've been sharing the rest. I started by making four quarts of delicious Rapunzel vegetable broth (it's vegan!). This stuff tastes better than any other broth I've used before. It's quite flavorful. Then I filled up the rest of the pot with carrots, celery, red onion, black beans, corn, spinach, zucchini, fresh cilantro, garlic, tomatoes, red pepper, mushrooms. I think that's everything. Then I simmered it until the vegetables seemed almost done, added some quinoa, then turned it off 10 minutes later. So great! I love soups, too. Your photo looks yummy! I pretty much live on soups.